The danger of a new disaster is real and imminent. Nothing can justify the supreme international crime of launching a war against another country. Doing so always ends up hurting everyone involved. 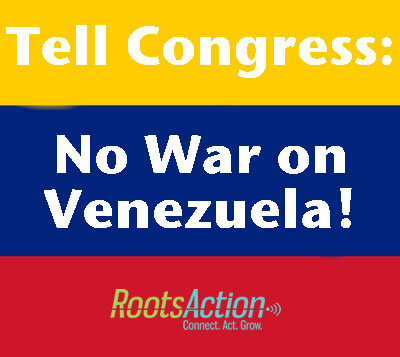 As your constituent, I urge you to fully support H.R.1004 to block unauthorized U.S. military action in Venezuela, including cosponsoring this bill if you have not already done so, or -- in the Senate -- to introduce and support parallel legislation. President Trump has been threatening military intervention in Venezuela. Moreover, his envoy Elliott Abrams refused to rule out an unauthorized military intervention in Venezuela when asked point-blank at a House Foreign Affairs Committee hearing. Invading Venezuela would not alleviate human suffering and would only add to the United States’ history of ruinous military interventions and would risk spiraling into a costly and devastating war of choice. Please support H.R.1004 now to block unauthorized military action by the Trump administration.